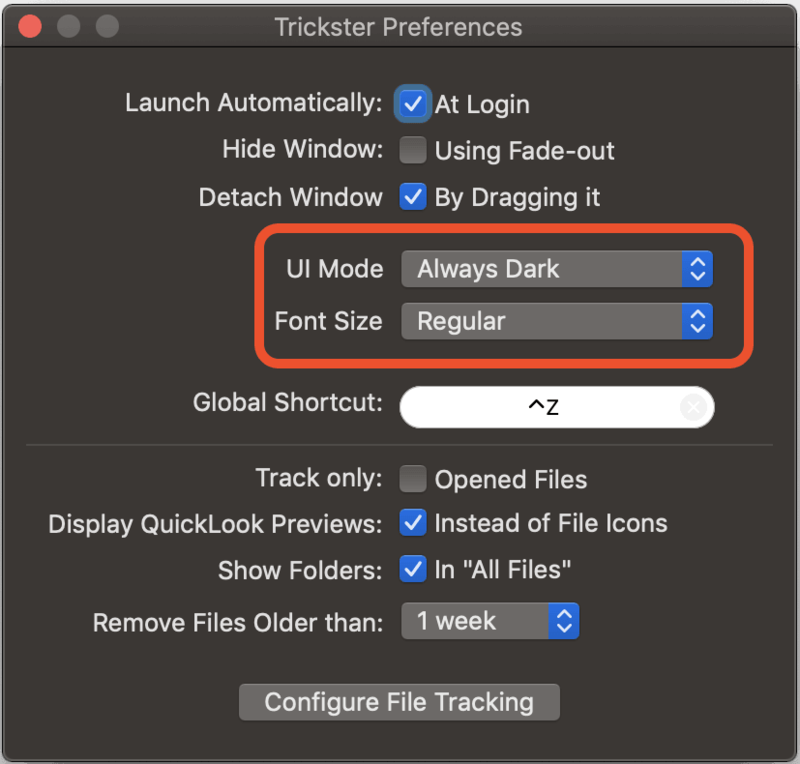 On the heels of Trickster 3.0 release, we added a couple of improvements to Trickster’s customizability. Dark or Light modes can now be forced independent of macOS system-wide setting. Font size for file list and their folders can be increased with 3 larger font settings. The User Interface now sports minor improvement to its look, especially to the bottom bar. If you want to adjust the folder font size independently of the file name font size, there’s a hidden command-line preference that’s described in the user manual. How often do you hear the words that it is too late for something, that old trees are not replanting? And how often do you see a smile of pity on the faces of your friends, when you think loudly about changing not only work but also profession at the age of 40? I often met with such reactions when I told my friends that I was going to learn programming and become a developer. Today, many of them congratulate me and admit that they did not believe in my success. Yes, at the age of 42, I decided to make one of my childhood dreams and learn to program, and maybe become a developer. 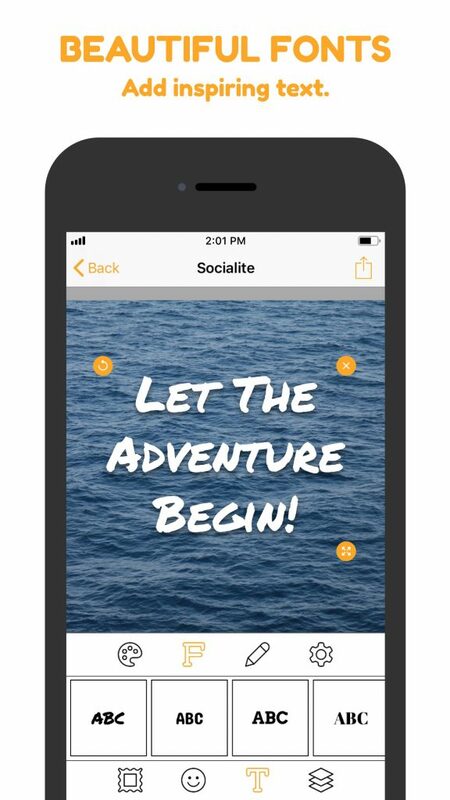 And even though my programming adventure is just beginning (the journey is the reward), I can already boast about Socialite, my first iOS application that I created together with my friends from Apparent Software. I will start from the beginning. 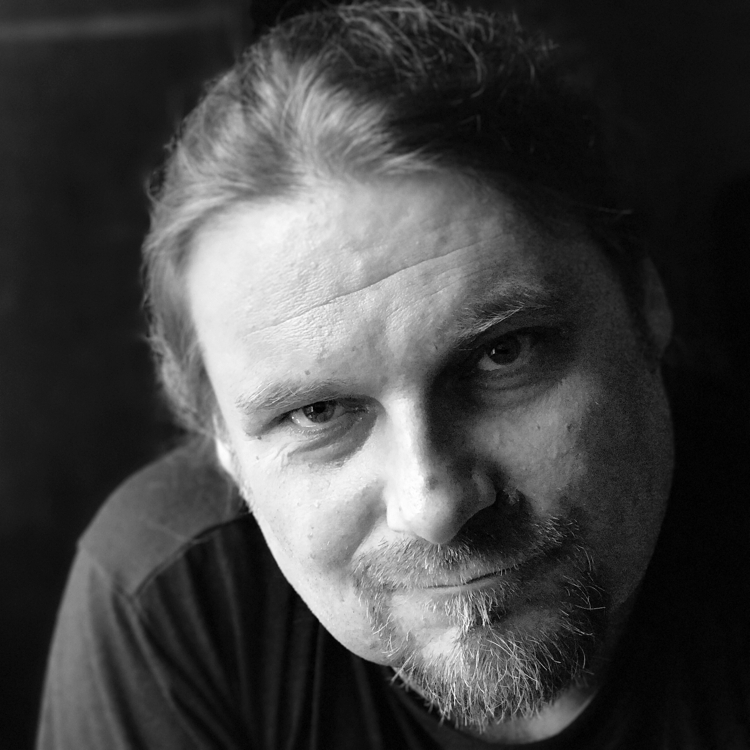 My name is Krystian Kozerawski and for the last 10 years I was one of the most popular Polish bloggers writing about Apple. When in 2008 I started my blog and told everyone that I wanted to live off of it, many thought I was crazy. 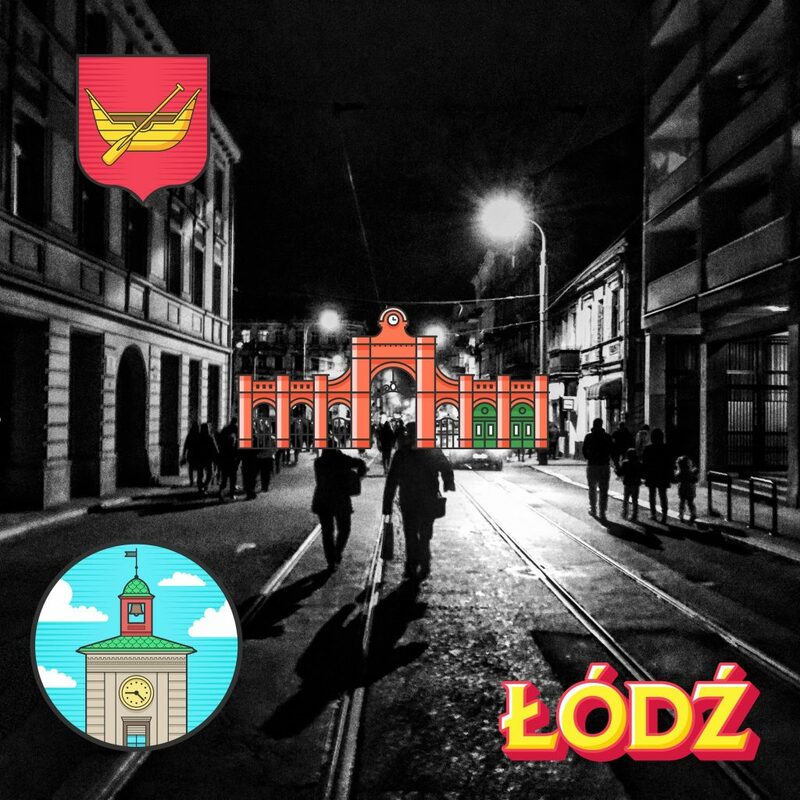 I have created my own brand in the Polish blogosphere with my hard everyday work and for the past 10 years my passion has been my source of income. A few years ago, however, I noticed the first symptoms of burnout. Being in my forties I was wondering what career path and passion to choose. Having at home a few Mac computers, iPads and iPhones and experience in terms of a critical look at applications (which I have been reviewing for many years), the choice seemed quite simple – I decided to become a programmer. Programming was one of my unfulfilled childhood dreams. I started my adventure with computers at a time when Poland was behind so called The Iron Curtain, and these machines were smuggled into the country. 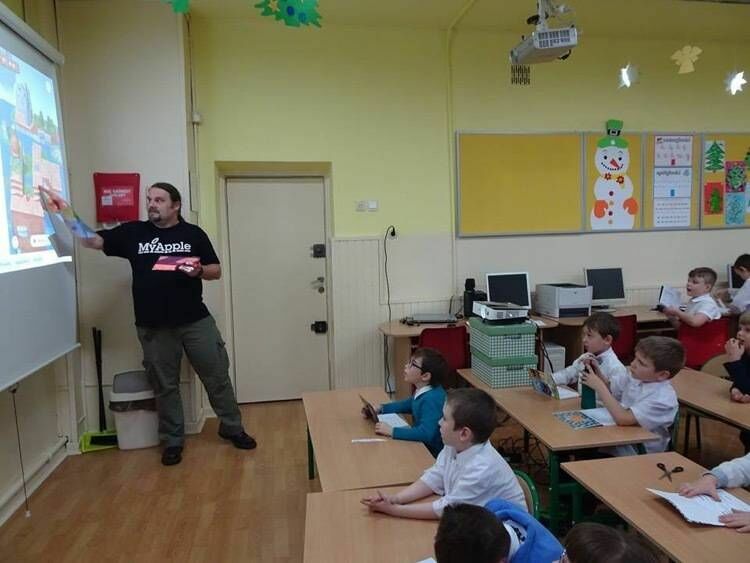 At that time, I attended a computer club where up to ten children where gathered around one ZX Spectrum or Commodore 64. As you probably guessed, little time, which each of us had at our disposal, was devoted to much more attractive games than to learn programming. Although I learned a few basic instructions then, but my use of the programming language was limited to the load instructions only. Symptoms of burnout as a blogger increased, which pushed me towards making a decision. Finally, in January 2016, I started learning Swift from the first textbook I bought. From that time on, I devoted a daily of one to three hours a day to learning programming. I must admit that the remote work from home and the unlimited work time of a blogger helped me a lot. I had time to learn, to think out, even to take a walk in the woods to clear my mind and put the things I had learnt in order. Learning programming language without any real experience reminds me a work of detective who collect the evidence that at the beginning seems not to be connected. During first year of learning Swift language I sometimes didn’t understand the obvious things, and I had to take them as they were. Then after a few weeks, and sometimes even months, I learned something that made concepts previously hard to comprehend so obvious or even trivial. 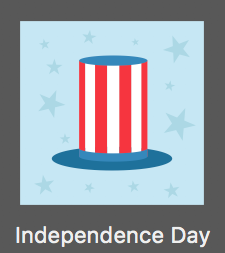 I was buying other digital textbooks and going through each learning project they provided. 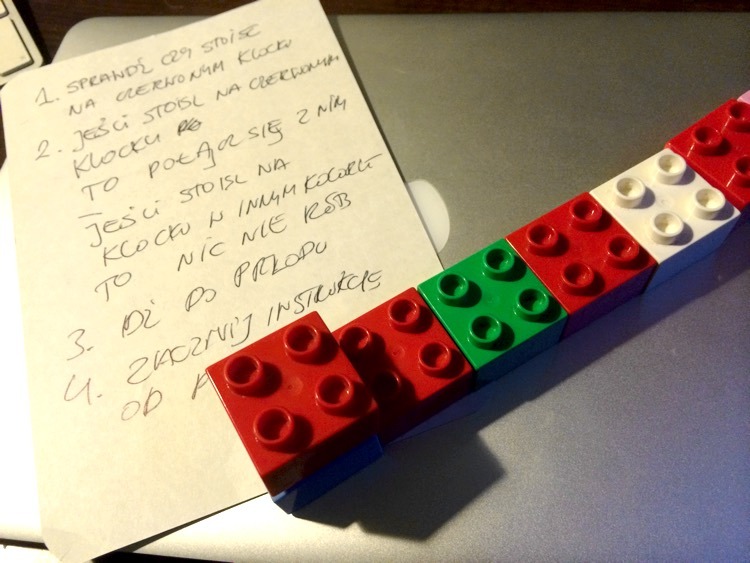 Well, this was not an impressive code, but I was still surprised when my 4.5 year old son, who had learned to read and write a few months earlier, did the job without any problems. Later, I created a few more such programs. Then came lessons on the computer, and more specifically a simple programming course for children on the Code.org website in which the robot BB-8 from Star Wars is programmed. Finally, with the beta of iOS 10, the Swift Playgrounds app appeared, which my older son started to play with. 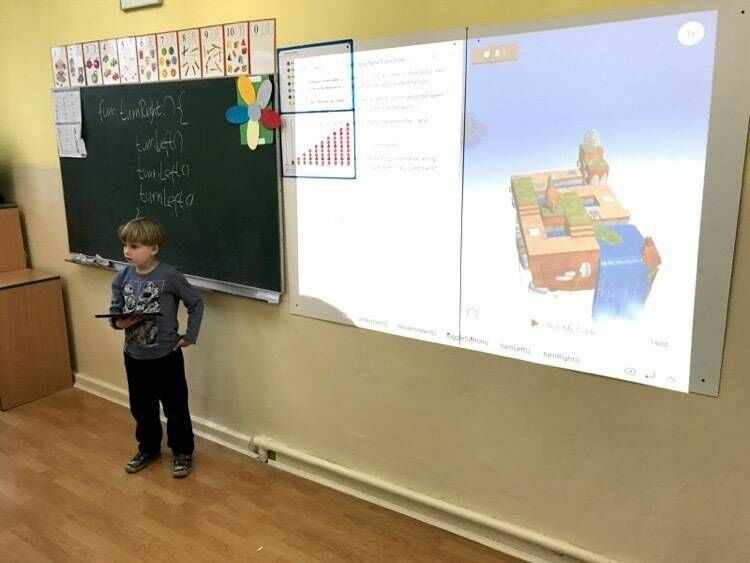 A few months earlier, in the first school year, I had the opportunity to give a full-day class in a class of my son, which showed children holograms, simple virtual reality in Google Cardboard glasses and Sphero controlled and programmable toys. The reception on the part of children was phenomenal. Actually, they did not want to let me out of the classroom. Remembering this, I thought that since I teach my son the basics of programming in Swift Playgrounds, I might as well do it voluntary (pro bono) in his class. Although children have lessons in so-called computer science, but it is really simple and quite reproductive computer skills, which of course is also needed (even my son, who only in the classroom has contact with Windows). 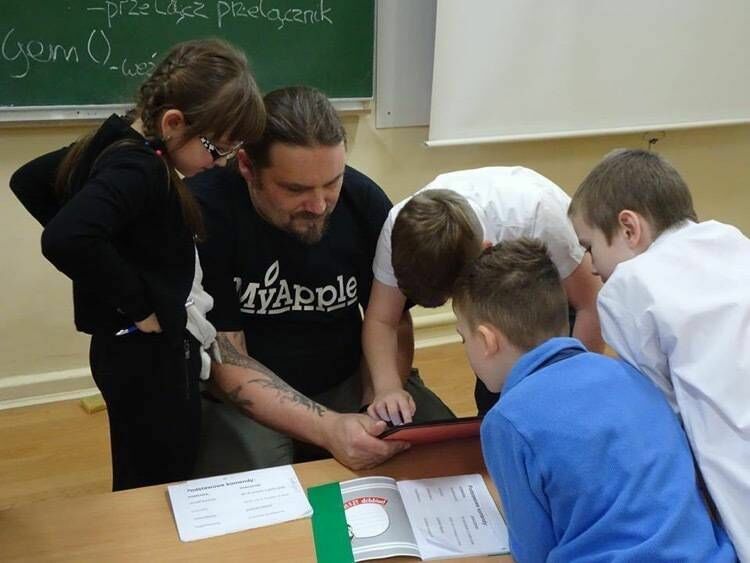 However, I think that most of them do quite well with computers, smartphones and tablets, and what they should learn immediately after gaining reading and writing skills is the basics of programming. The programmer is still one of the most sought-after professionals on the market (tens of thousands of programmers are wanted on the European market). I shared the idea with other parents of kids from my older son’s class, I have also shared the idea with the teacher and I came back to him at the first September meeting, but it took two more months to get the permission of the school management and write a simple program for these lessons, although I do not conceal that, apart from the very general framework, a lot of my learning is improvising and things invented ad hoc, a few hours before or during classes. I teach children at school once a week. For the last two years — as I wrote above — I have been learning programming myself from textbooks usually one to three hours a day. Finally, in September last year, I decided to check how much I know. As a 43 year old I came to an internship in one of the software houses in my home town. And a few months later my friend Jacob Gorban of Apparent Software said that they are looking for a Junior Swift Developer. Years ago me and Jacob have met at Macworld in San Francisco. Jacob was one of exhibitors and I was a journalist. After the show we stayed in touch, for sharing the same passion about the music. And then it appeared that we share also the programming passion. 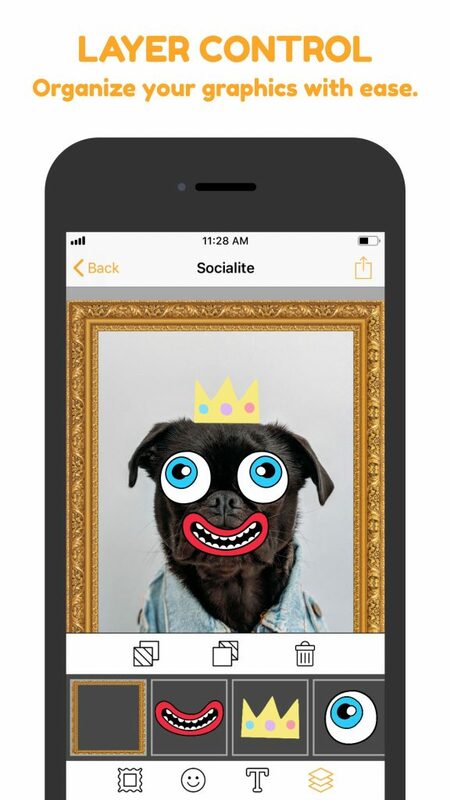 With a helping hand of Jacob who is obviously much more experienced developer I started my work on Socialite. And it is not only just an app. Since we all at Apparent Software share passion to the music (and a few of us are also musicians) from the very beginning I was thinking about Socialite as of the song of a band. Our common work, filled with our passion and pieces of our own personalities. 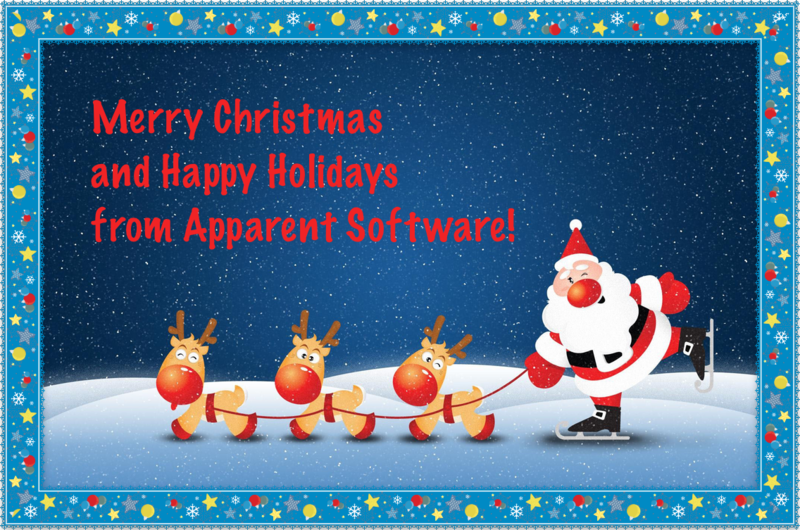 At Apparent Software we are based both in Canada (Winnipeg, Toronto), USA (Chicago) and Poland (city of Lodz) we knew we want to do something for our local communities. 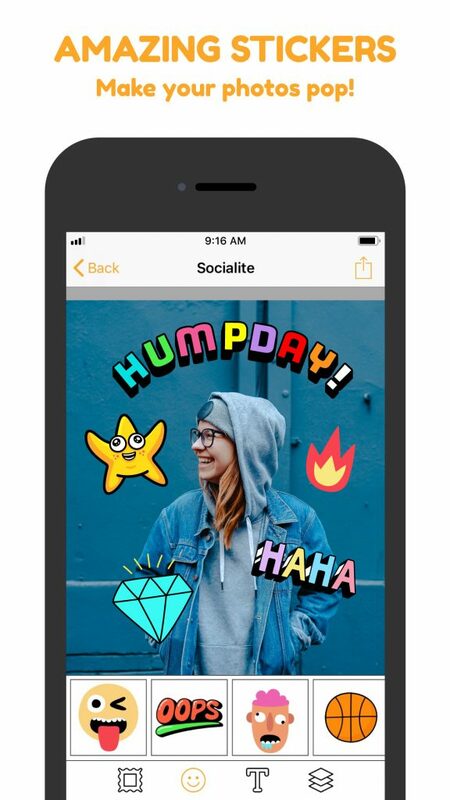 That is why you are going to find in Socialite sticker and frames packs that depict famous places in our own home towns. For me as a Pole very important is link between the place I live and the second biggest Polish city in the world – Chicago. You know that almost every Polish person in Poland has relatives in Chicago? And it is not just an urban legend. I do have them, and releasing feature pack for Polish community in the USA and especially in Chicago I am making a commitment to find them. So here it is. Socialite, the effect of real commitment in making old dreams come true. There is never too late, and as long as you believe in yourself and there are people who want to share their own experiences and knowledge the impossible is nothing. 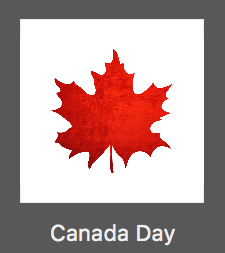 Please note that ImageFramer now has its own site on imageframer.net domain. 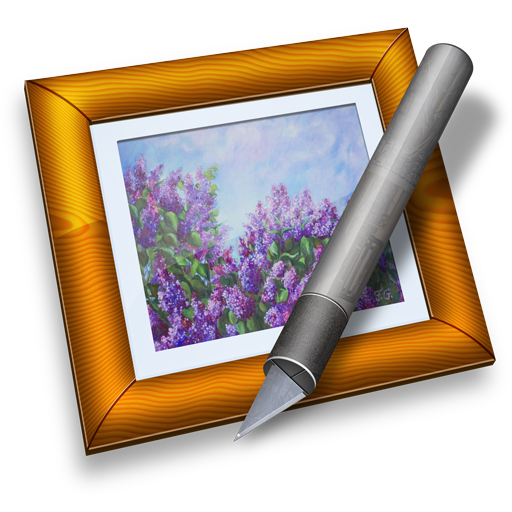 All ImageFramer news and framing tutorials moved over to the new site as well. We believe the new site is better and less confusing for you, our customers. Licensing-related actions and other application stay on this site, https://www.apparentsoft.com. 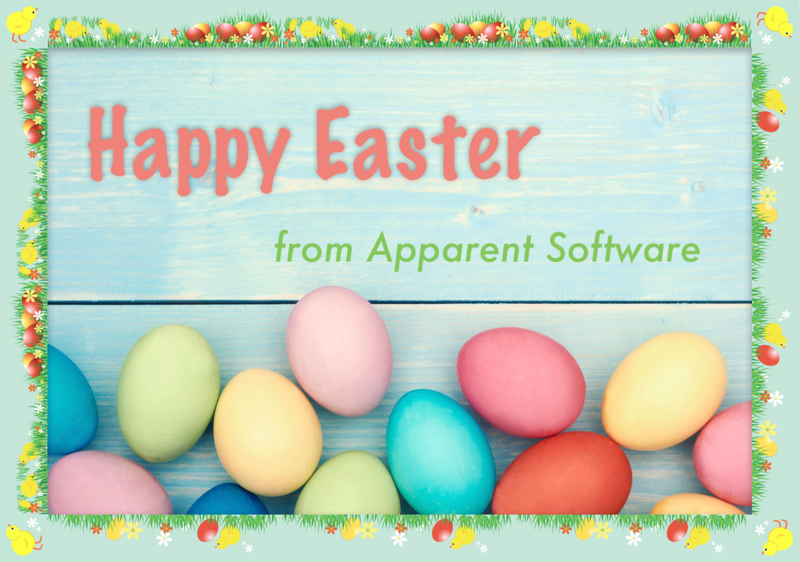 Wishing you an Easter that is bright and happy! 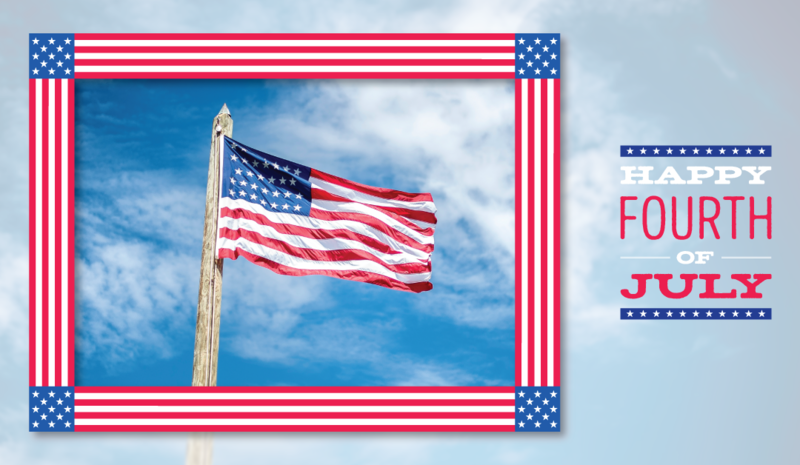 Have fun making your Easter greeting cards special with ImageFramer! 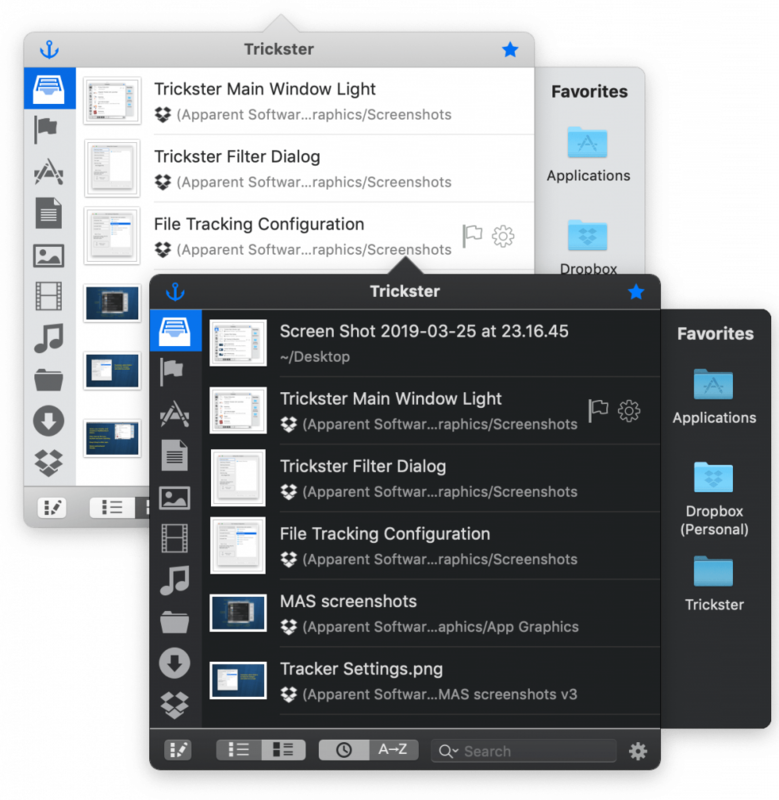 This new release of Trickster brings some of the features that you, our dear customers, have requested. So please keep your requests coming. Visit our Trickster Suggestion forum on the support portal to start public discussions into feature requests and to vote on other people’s suggestions. We’ve designed a Light theme for the file list. You can select it in Trickster’s Preferences. Trickster usually shows QuickLook previews of files in the Expanded row mode. 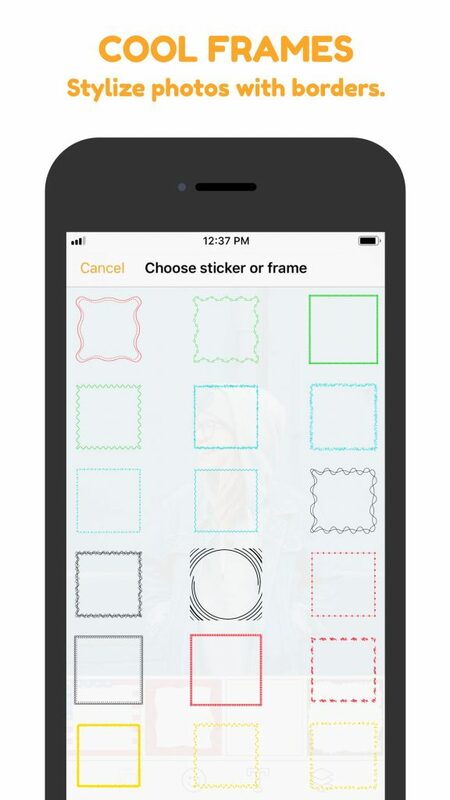 With a new option added in this release, Trickster can now only display generic file icons. This behavior can be useful when you’re more concerned with what application will open the file than with its content. Text files can especially benefit since their preview provides little information about their content. Did you know you could drag files from Trickster (or from Finder) unto folders in Favorites sidebar and have them moved or copied (by holding the Option key) there? 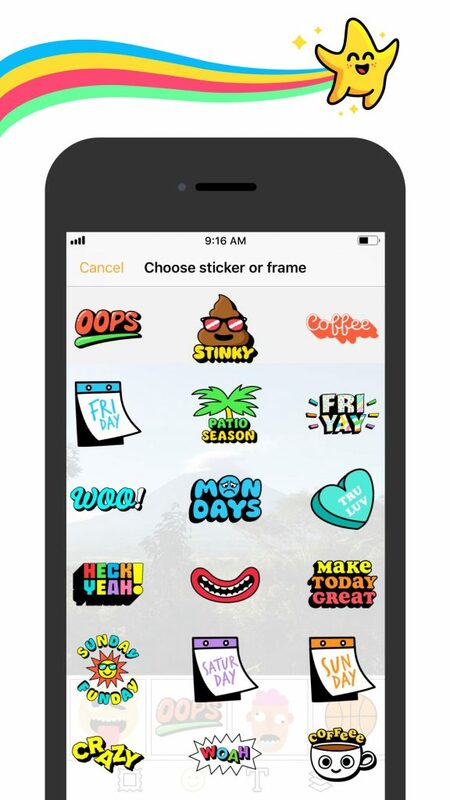 If you didn’t know, try it — we created the sidebar with this use-case in mind. 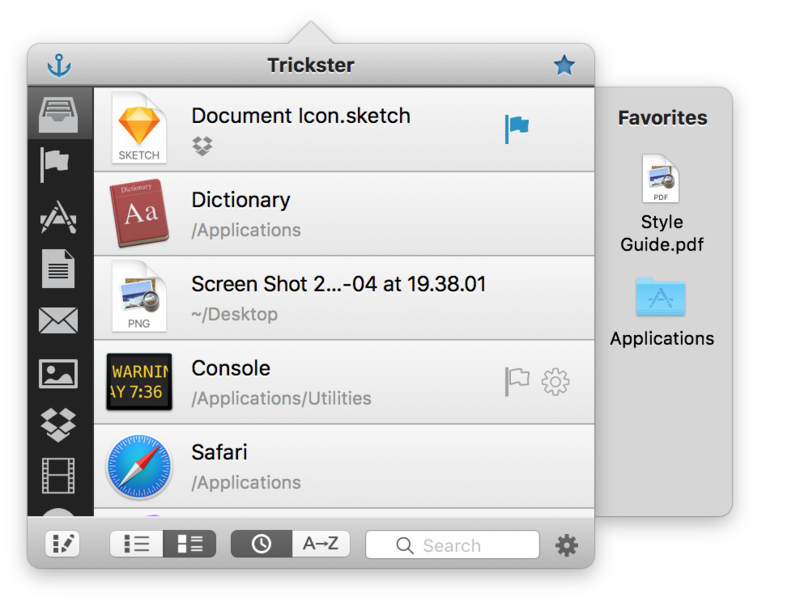 Previously, though, Trickster silently failed to move or copy when the destination folder already contained a file by that name. Now Trickster will detect this and suggest to overwrite the file, if you want. The original file will be moved to Trash, just in case. Unfortunately, this behavior might fail on macOS Sierra because of increased protection of /Applications folder by the system. 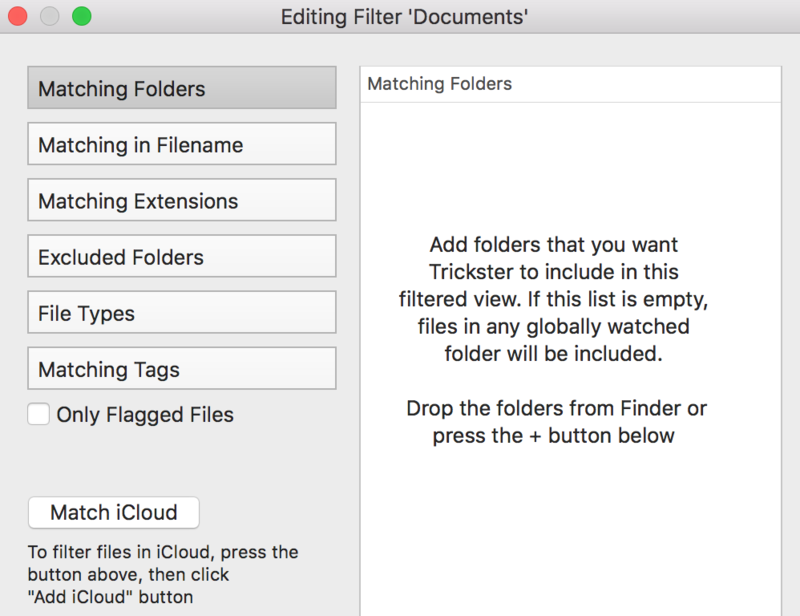 When you have no entries in a section of the File Tracking Configuration or when editing Filters, Trickster will now display a description of what this section means and how to edit it. 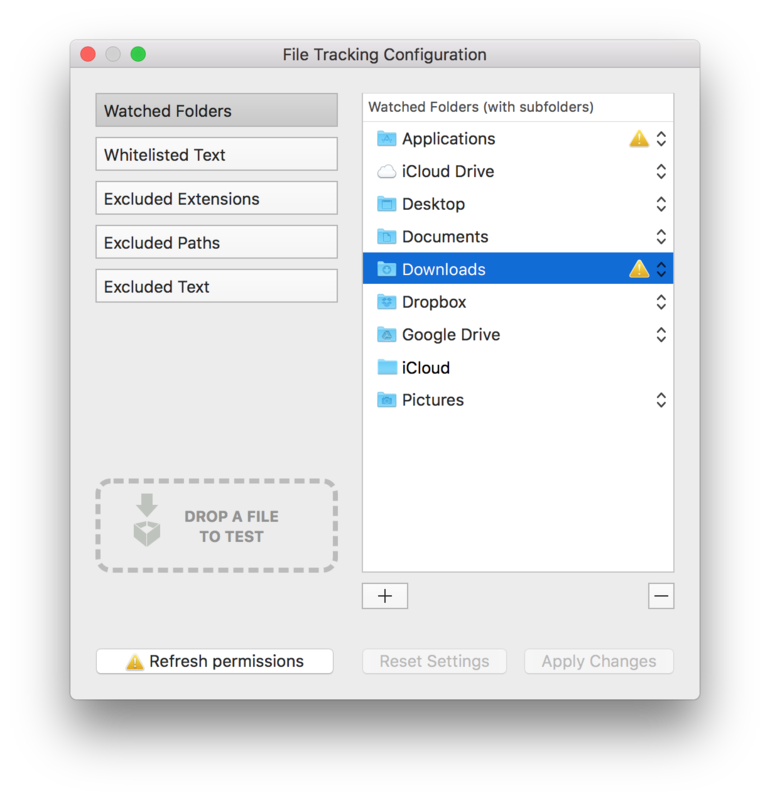 Trickster will now fail less to monitor folders that you want it to monitor. It now correctly detects when it doesn’t have permission to monitor it. 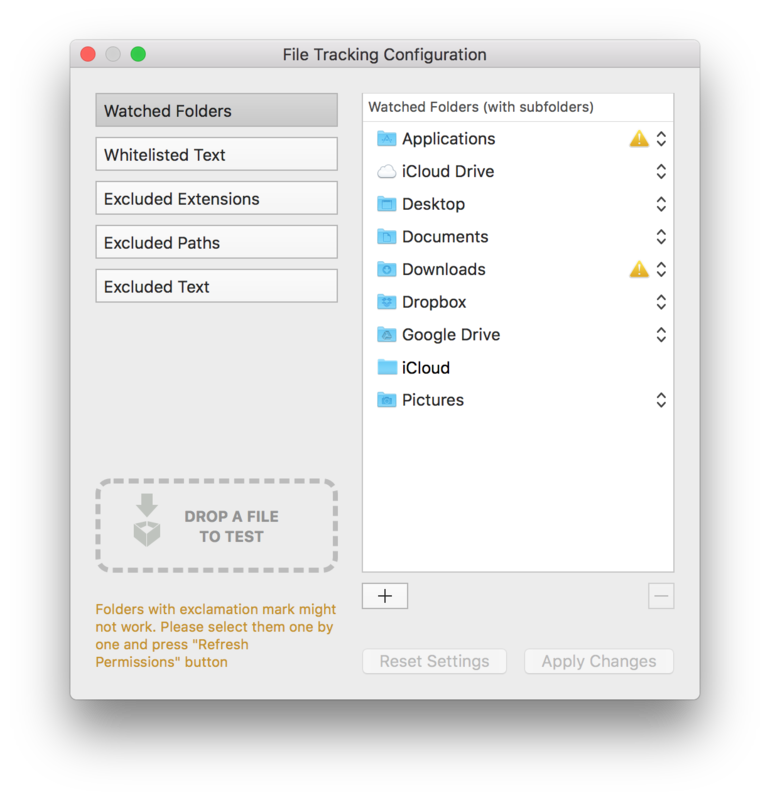 And to help you see when it fails, the File Tracking Configuration panel will mark these watched folders with a yellow exclamation mark. In the screenshot below, Downloads and Applications are not working anymore, and their permissions need to be refreshed. Select the folder, Downloads in this example, and a button titled “Refresh permissions” will appear (see screenshot below). Click on it. Trickster will remove Downloads from the list and will present an “Open Dialog” with Downloads folder selected. Just click the “Refresh Permissions” button on the bottom left of this dialog to add Downloads back with the new permissions. Now you don’t need to wonder if a folder is monitored by Trickster or not, because of Sandboxing permissions. We sincerely hope you like the changes.